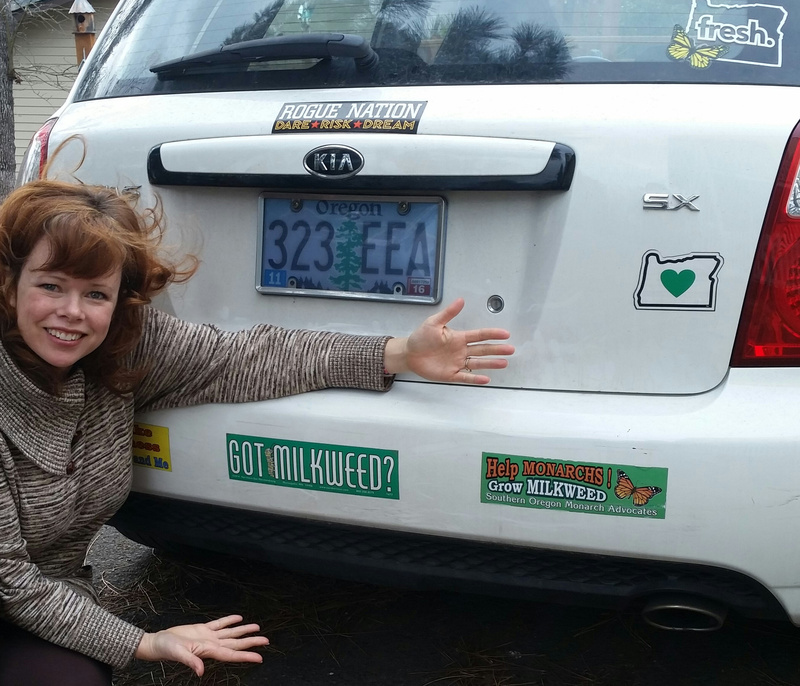 As Southern Oregon Monarch Advocates, a significant portion of what we do is educating, advocating, and empowering people to plant milkweed (asclepias family). Why? Because although adult monarchs can nectar on numerous flowering plants, monarchs lay their eggs on one plant only - MILKWEED, and it is the sole food source of monarch caterpillars (larvae). Additionally, Southern Oregon has been noted as prime monarch breeding habitat, sustaining Northward bound monarchs, Southward bound monarchs, and some generations which spend their whole lives right here in Southern Oregon. This knowledge compounds how essential milkweed habitat is for monarch survival, and yet critical milkweed is destroyed every day in our region by pesticides, mowing, plowing, urban development, and more. Thankfully, some of this critical monarch habitat can be restored simply by planting milkweed on private properties, in parks, and on other public lands, as well as learning to identify milkweed to actively protect existing monarch habitat. This section provides some basic information on how to identify native Oregon milkweeds, as well as how to get started growing milkweed so you can create habitat and help monarchs right away. It is also important to know that although planting milkweed is an essential step in monarch conservation, creating and sustaining other components of monarch habitat is also necessary, which is why SOMA advocates the creation of "monarch waystations", which combine milkweed with the other crucial components. Please see the Waystation section of our site to learn how to incorporate your milkweed into your very own monarch waystation. You will likely notice that although dozens of milkweed species exist, most conservation groups advocate planting native and locally sourced plants from that particular region, which is why the Southern Oregon Monarch Advocates largely provide information on native milkweed species of Southern Oregon, and how/where to get them. "Southern Oregon is home to three native species of milkweed: Showy milkweed (Asclepias speciosa), Narrowleaf milkweed (Asclepias fascicularis), and Heartleaf milkweed (Asclepias cordifolia). Showy milkweed (Asclepias speciosa) can be spotted in the Applegate along roadsides, in drainage ditches, in unplowed fields, and other locations within the valley bottom. This species ranges from the Midwest to the west coast and north into Canada. 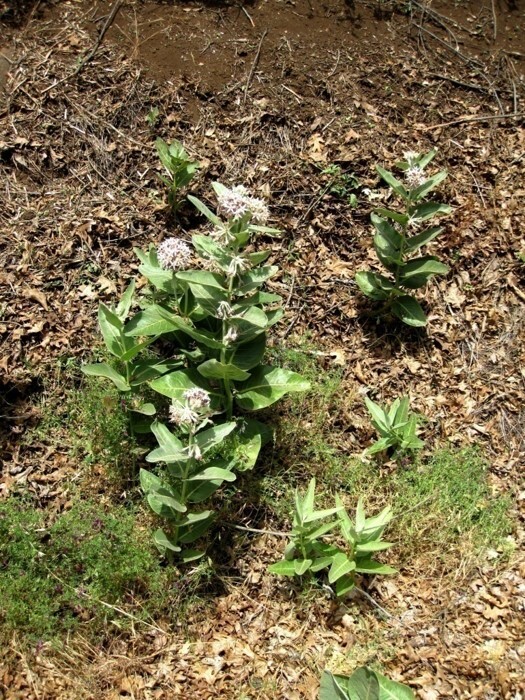 This is the largest of the milkweed species in the Applegate and the most common. Showy milkweed is considered one of the least toxic milkweeds. Narrowleaf milkweed (Asclepias fascicularis) is found mainly in the eastern part of the Applegate Valley as it transitions into the Rogue Valley, where it is more common. It has a long, narrow leaf and small, pale pink flowers with a distribution that includes most western states down to Baja California. This plant is rhizomatous and spreads readily. It prefers to grow in full sun in dry or moist conditions. Heartleaf milkweed is a spectacularly beautiful species that is native to parts of California, Nevada and Oregon. Heartleaf milkweed has a more dispersed distribution within the Applegate than the showy or narrowleaf milkweed and is less well known. 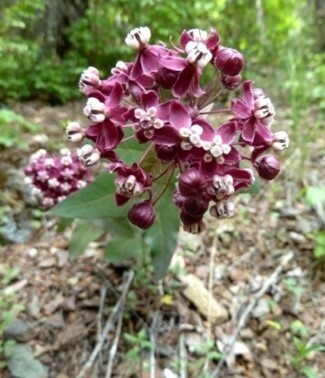 Heartleaf milkweed prefers to grow on rocky slopes or outcrops in woodland and coniferous forests. In the Applegate it can be found mainly in the foothills, with known populations in the Upper Applegate and Little Applegate. Native Americans used the fiber in milkweed plants for the creation of ropes and nets. Anthropologists found a 40 foot long deer net made from heartleaf milkweed that required an estimated 35,000 plant stalks to construct." 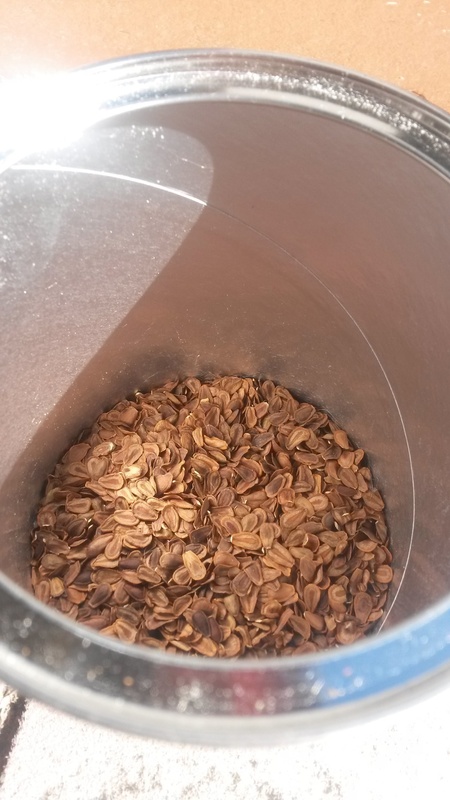 If you are interested in harvesting seeds yourself, this can be easily done once you learn how to identify milkweed. In our region, Narrowleaf milkweed and Showy milkweed can often be found with seed pods bursting open with fluffy white pappi and abundant seeds in August and September (approximate, and this can vary). As you learn to identify these plants along roadsides, pasturelands, or other places, it can be a simple task to harvest some seeds in a bag or container, after which you can take them home and finish preparing them for planting. 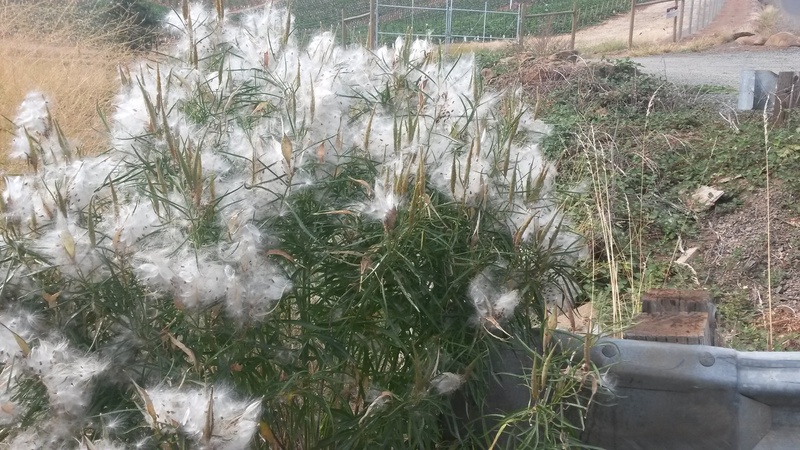 If you would like to purchase milkweed seeds or plants, the market in Southern Oregon is still developing, but here are a few great leads to get you started! Congratulations on your decision to grow milkweed, create essential habitat, and help monarchs! Growing milkweed can be done from the germination of milkweed seeds, the harvesting and transplanting of milkweed rhizomes (the branching roots which spread underground), or the planting of entire milkweed plants. 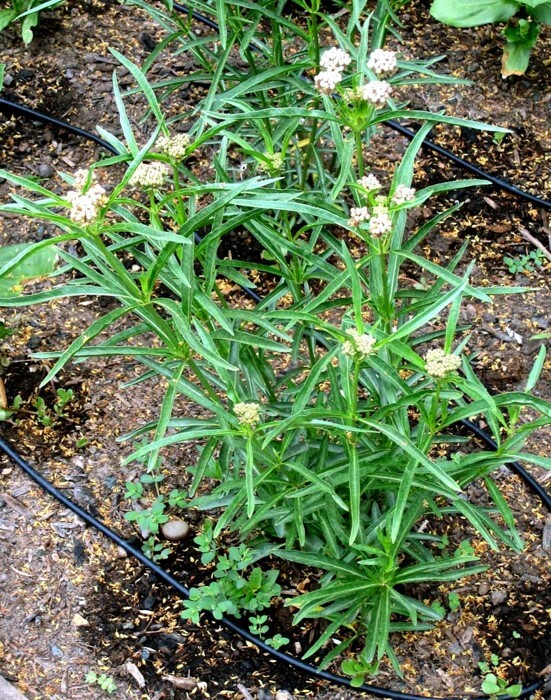 It’s important to know that our local milkweed generally likes full sun, can spread significantly over time, and needs irrigation or watering until it becomes established. To successfully grow milkweed from seeds, take a look at the following article contributed by Tom Landis (another avid monarch conservationist, educator, native plant nursery specialist, and a Southern Oregon Monarch Advocate). Connor Wyatt, age 4, plants Narrowleaf milkweed to help Monarchs in Medford, Oregon. Way to go Connor! 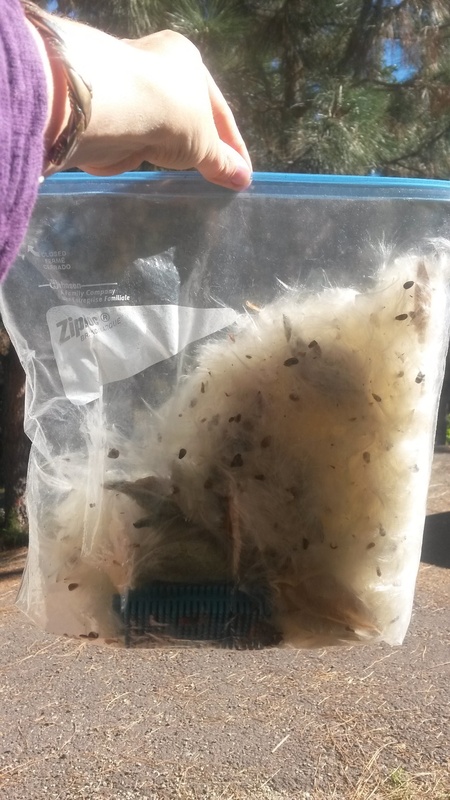 Milkweed seeds need to be rinsed in running water to clean away any fungus spores, so put the seeds in a small mesh bag or make one by using a paper punch to put holes in a small zip-lock plastic bag. 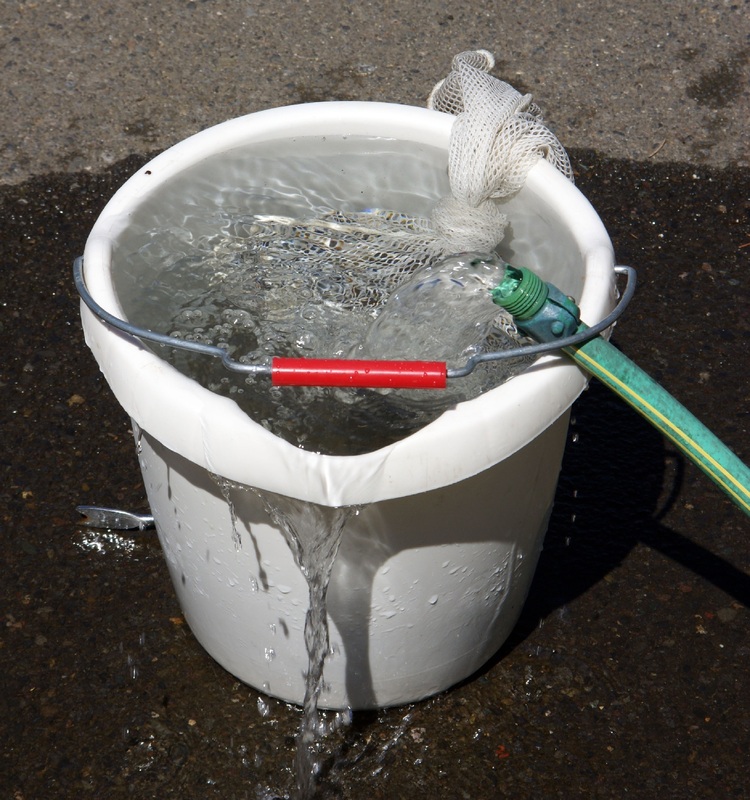 Put the bag of seeds in the bottom of a pail and then just let water vigorously flow past the seeds and out the top of the bucket for about 30 to 45 minutes (Figure 1A). If you have just a few seeds, you can just do this in a pan in the kitchen sink and let the bubbling water run down the sink. Native plant seeds, including many milkweeds, are dormant and require a cold, moist period before they can germinate; this exposure happens naturally during winter. Stratification is a nursery term that describes the combined use of moisture and cold temperatures to overcome seed dormancy. Sandwich stratification is the best procedure for small amounts of seeds. Use a single sheet of industrial paper towel or a stack of kitchen towels and moisten them completely. Drain off the excess water by vertically holding one end of the towel . Then, place seeds one layer deep on 1/4 of the paper towel surface, spreading the seeds evenly across the moist paper towel so that they do not contact each other. This will help prevent the spread of mold to other seeds. 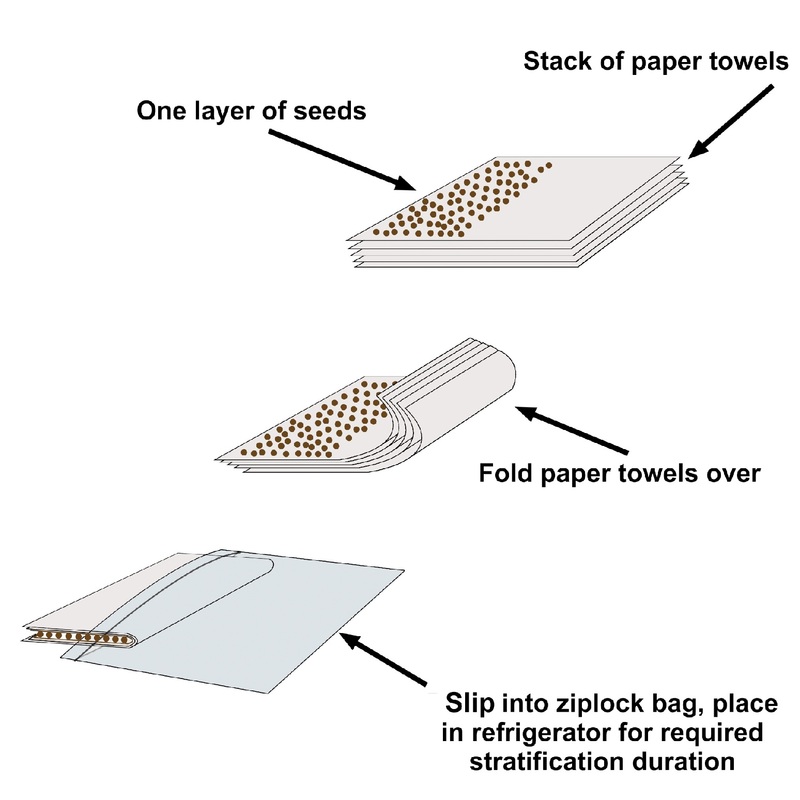 Fold the paper towels over the seeds (Figure 1B), and place the sandwich into a clear, plastic zip-lock type bag and put them into a refrigerator. Check occasionally to ensure seeds are moist and not moldy. If mold develops, remove the sandwich, open it, and rinse the seeds under cool, running tap water. Wash out the zip-lock type bag with warm water and soap. Spread seeds onto a new stack of moistened paper towels, put the sandwich back into the bag, and refrigerate. Keep checking the seeds every week or so until they begin to germinate (Figure 1C). Figure 1 - Milkweed seeds need to be cleansed in a running water rinse (A), and then stratified under cold and moist conditions (B). Seed should be sown after they just begin to germinate (C). Direct seeding. You can plant milkweed seeds in the fall or winter so that they will undergo natural stratification before germinating the following Spring. It’s still a good idea to cleanse the seeds with a running water rinse before sowing, and then covering the seeds with the thin mulch. Milkweed seeds should be sown shallowly - less than ½ inch. Sowing germinants. 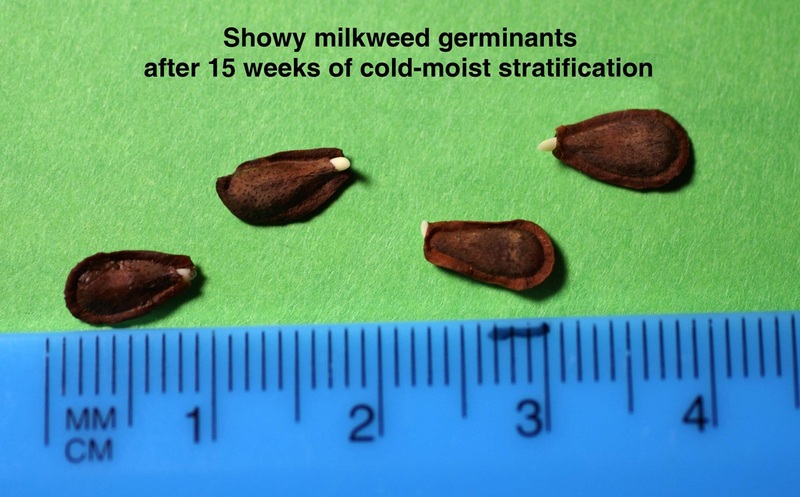 If you stratified your milkweed seed, you can just sow them as they germinate (Figure 1C). Place each germinant into Jiffy pellet (Figure 2A) or sow then directly into the soil and cover with a light mulch. Jiffy pellets allow young plants to be transplanted without damage to the root system. Seed balls. These are a good option because they permit precise placement and protect the seeds from weather or predators. When placed in the Fall, allow for natural stratification. Make a mixture of clay and screened compost with enough water until it achieves a cookie dough texture. 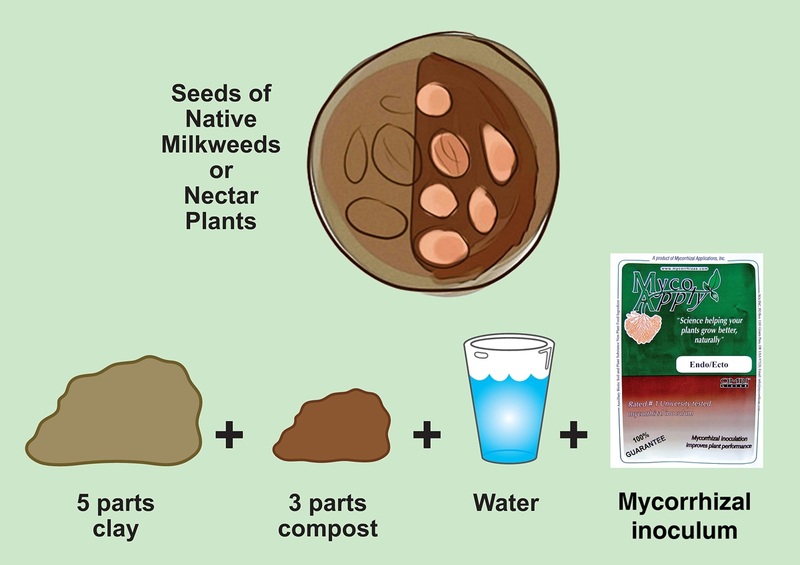 Adding a small amount of powdered mycorrhizal inoculum is a good idea (Figure 2B). 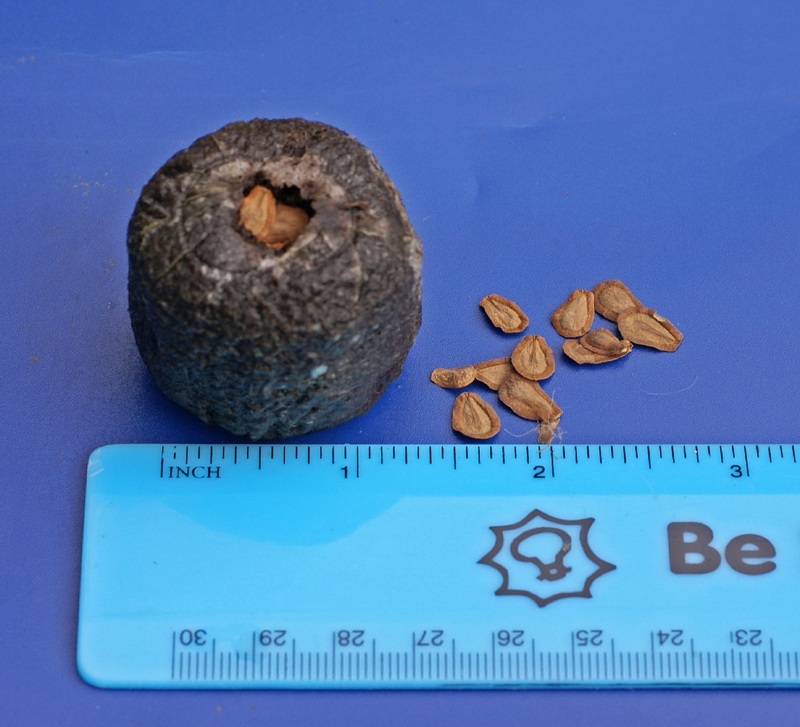 Roll the mixture into small balls, make a dent and then add 2-5 milkweed seeds and reform into a ball. Plant the seed balls in the fall just below the soil surface and cover with a light mulch (Figure 2C). Water initially and then as needed until seedlings are established. You can purchase seed balls or ingredients from the following website or on Facebook: seed-balls.com/. Figure 2 - Seeds can be sown in Jiffy pellets (A), direct seeding, or seed balls (B). 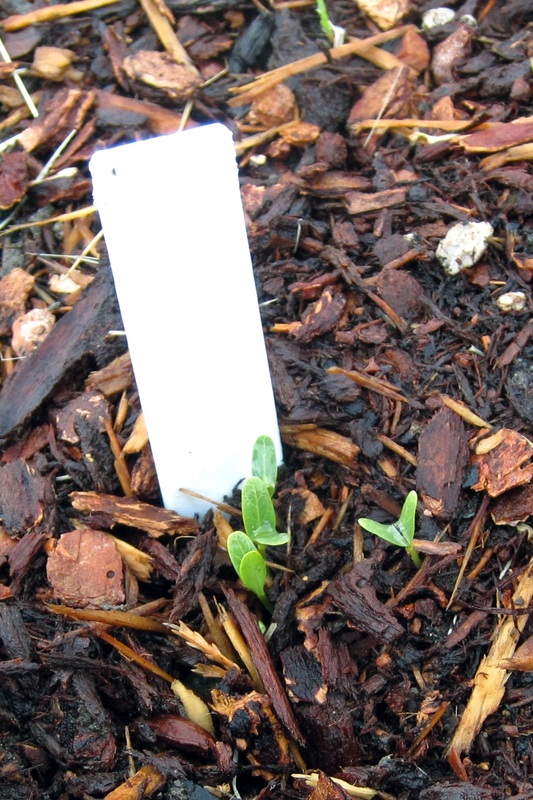 Sown seeds or seed balls should be covered with a light mulch to protect seeds and conserve moisture (C). For more in-depth guides to the native milkweed species of Oregon and how to grow them on a larger scale, take a look at these links to some wonderful publications (PDF) from the Xerces Society for Invertebrate Conservation.